Troy is a kid with a passion. And dreams. And a desire to do the right thing. But after taking a wrong turn, he's forced to endure something that's worse than any juvenile detention he can imagine -- he's been "sentenced" to the local city stables where he's made to take care of the horses and learn to play polo. The greatest punishment has been trying to make sense of things after his mom died. Troy's also figuring out which friends have his back, which kids to cut loose, and whether he and Alisha have a true connection. Laced with humor and beating with heartache, this novel will grip readers, pull quickly, and take them on an unforgettable ride. Set in modern Philadelphia, Christine Kendall's stunning debut lets us come face-to-face with the challenges of a loving family that helps turn hardships into a horse of a different color. It seems repetitive to mention the need for books like these when I was a youth--but I can still see this same need for African American young adults today--a story that features an African American main character not lost in tragedy or highlighted in negative stereotypes associated with blackness--or being black. 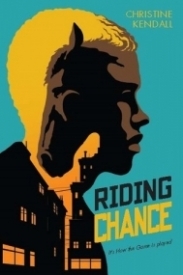 Riding Chance is a positive story of hope with a core of realism and black boy joy. Riding horses in the African American community is synonymous with whiteness. For some, it's not something that seems possible--or even "black." The aspect of a riding program for 'troubled youth, for lack of a better word, is the most beautiful part of the story. It shows young black children and young adults that nothing is outside the realm of possibility. While this seems a little heavy to put on such a short mild-mannered novel--these are the kinds of things that can be picked up from someone who's mind might not be as open to the possibilities they cannot see. This is the hope they wouldn't see in their day-to-day lives. Despite that, the novel felt very fluid--easy to read and devour. It's rather short but felt very comfortable to read like sitting with an old friend. My single complaint was the lack of emotional connection outside of the people and the horses. Some of the relationships lacked emotional depth. The author could've dug a little deeper in the relationships--not limited to the possible romantic connection between the MC and Alisha. It also would have been nice to see more of the horse camp. It would have given the story a more lush--and engaging feel. This is not to be overly critical but observant--as mentioned I rather enjoyed the story. A realistic novel with a not so unique backstory that will sit well with young readers--that will embolden them to dream bigger.